Marketing Acuity has a seasoned team of experienced marketers, a couple of fresh thinking Millenials, and a really smart Australian Shepherd. From marketing research to application of smart technology, we apply unique solutions to your challenges. We listen, adapt and apply so we can be the best marketing consultant for your business, company, or association. Ann Siegle has a B.A. in Advertising from Michigan State University with an emphasis in marketing and advertising design. Ann Siegle was CEO of Spoke8 Marketing from July 2012 – June 2015. From 2003 to 2010, Ann was a Partner at Tria Design & Marketing. Ann’s early career included a decade in her own marketing/branding firm Paradise Graphic Design, stints in publishing and a career as an entrepreneur and employee in high tech marketing. As a marketing consultant, Ann has spent more than 25 years helping businesses grow and achieve their goals. Ms. Siegle is also an active advocate for health and health care not-for-profits including HOPING, a child-loss support group for Mid-Michigan parents for neonatal and postnatal infant loss. She is a founding member of the Capital Area Breastfeeding Coalition and active in bicycling advocacy for organizations such as League of Michigan Bicyclists and the Tri-County Bicycling Association. Ms. Siegle guest lectures and gives presentations on marketing and communications as tools to achieve business success. Ann and George Siegle founded and ran the Tour de Road America Foundation from 2004- 2018 together with cycling friends in Wisconsin. The Tour donates over $30,000 annually, raised from the Tour de Road America bike ride, to cancer charities the Austin Hatcher Foundation and the Vince Lombardi Cancer Clinic. 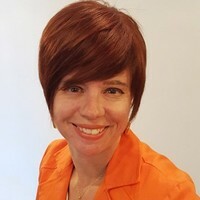 Ann Siegle is a certified Inbound Marketing professional, and holds Inbound Marketing, Hubspot Certification and Partner Certification from Hubspot. 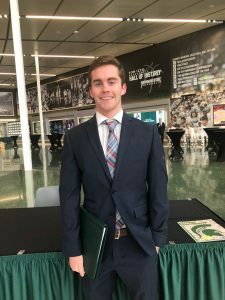 Matthew is currently a junior enrolled at Michigan State University pursuing a Bachelor’s degree in Marketing. He plans to graduate in spring of 2020 and obtain a position as a market research analyst. Matt is a member of a professional business fraternity known as Phi Gamma Nu. He assists the golf outing committee to plan and execute the frat’s most successful fundraiser. In addition, he’s a regular volunteer at the Coven House to mentor underprivileged kids. Matt is also involved with a charity known as Little Dresses For Africa. They have sent millions of dresses to Africa along with raising thousands of dollars. He recently started an Instagram on their behalf to raise awareness and gain support. Outside of school, Matt is fond of playing golf and analyzing sports. He hopes to combine marketing with sports to enjoy a successful career. 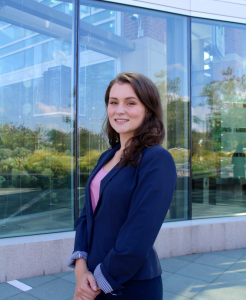 Amanda is a junior enrolled at Michigan State University working toward her Bachelor of Arts in Marketing with a minor in graphic design. She is certified with Hubspot in Inbound and Content marketing and also with Advanced Google Analytics. Graphic communications courses throughout her time in school have sparked her passion for art, which has been the main influence in her degree choice. While Adobe Creative Suite is her favorite, she also loves learning new platforms to design on. Providing freelance marketing services for multiple organizations has allowed her to gain experience in design, social media, and digital analytics. Stepping into a mentor role within her organizations has grown her passion for giving back and inspiring young professionals to pursue a career in Marketing. When she is not studying or working she loves to explore new hiking spots and coffee shops around Michigan. Vice President of Marketing and Business Development for Marketing Acuity, LLC and serves as a consultant on projects. Mr. Siegle is Senior Director of Product Marketing at EverBridge. In his twenty-five-year career, Mr. Siegle has worked with numerous organizations to improve top line performance. Areas of expertise include strategic planning, product innovation and management, marketing strategy, branding, value messaging, digital strategy and communications, and business development. Previously, Mr. Siegle was the Director of Business Marketing and Web Development for the Michigan Economic Development Corporation (MEDC). He led the development and implementation of the MEDC’s social media and digital marketing campaigns. He also led a branding team that helped the MEDC articulate the key messages for businesses considering Michigan as a start-up or investment location. Mr. Siegle performed several roles for Delta Dental of Michigan, Indiana, and Ohio and its Renaissance affiliate. He most recently directed product and service innovation, helping the organization bring new-to-the-world and refreshed products to market. In the role of market strategist, he led the development of Delta Dental’s strategic marketing plan. He began with Delta Dental as a project manager consultant and member of the marketing team for the start-up of Renaissance. Mr. Siegle spent five years as a Senior Strategist at a leading Michigan-based consulting firm. In this role, Mr. Siegle worked with clients in the areas of strategic business, marketing and sales planning; market research; and new product development. He worked extensively with companies such as Masco, Delta Faucet, AAR, and Emerson Electric’s Westinghouse Process Control subsidiary. Previously, Mr. Siegle led the marketing function at Deneba Software, a Miami, Florida-based developer of professional and consumer-market graphics software. He has additional marketing experience with Microsoft Corporation and Holiday Inns, Inc.
Mr. Siegle earned a Master of Business Administration in marketing with a sub-concentration in finance from Michigan State University’s Eli Broad Graduate School of Management. His Bachelor’s degree in business is also from Michigan State University. Mr. Siegle holds the designation of Certified New Product Development Professional. He is an experienced marketing consultant and ready to help your company soar!